Earthquakes are always a concern in California. 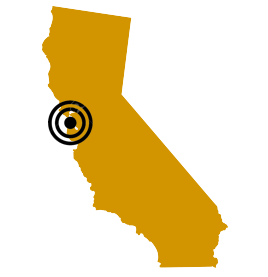 Without question, if you reside in the Golden State, you run the risk of experiencing an earthquake. If you are a homeowner, this is something you must consider when thinking about how to protect your asset. In 2016, there has been numerous minor earthquakes in Southern California, which have “shaken” the earthquake insurance market. There are constantly new reports and studies being conducted to try and predict the likelihood of the next earthquake; when, where, and how big? The latest U.S. Geological Survey (USGS) report does not predict when, where, or how big the next quake will be, but instead provides a better idea of how often earthquakes will occur and how likely faults will break over the next 30 years. This data is currently being used to set earthquake insurance rates and building codes in California. The USGS states, “homeowners are more likely to be threatened by a small local earthquake, than a big, rare, distant earthquake.” Analyst predict that an earthquake of a 6.7 magnitude should occur once every 6.5 years somewhere in the state of California. Whereas the chance of a magnitude-8 earthquake occurring over the next 30 years is 7%. The California Earthquake Authority (CEA) has recently released data that states an increase of about 29,000 policies in the first eight months of this year (2016). Which is nearly double the number of new CEA policies purchased in all of 2015. It remains uncertain what caused this spike, but regardless there is no doubt Californian’s are seeing value in insuring against earthquakes. As technology advances and more studies come out, there is still one factor that will remain constant; we never will be able to predict exactly when and where the next big quake will occur. If it does occur in your lifetime, will your assets be protected? Going without earthquake insurance is a gamble many Californian’s take. However, we have seen in recent history how other catastrophic disasters can impact communities when they’re not prepared. Keep this is mind when considering how to protect your home. Prospect General is a Managing General Insurance Agency located in La Jolla, California that focuses on specialty insurance products. To become appointed, or to learn more about their Real Estate Investor Insurance product, please visit their website at www.ProspectGeneral.com or contact Jorge Martinez, Director of Sales & Marketing, at (619) 597-1274.